“Of all the continents, Europe is the most beautiful. Of Europe, The Netherlands is the most beautiful country. Of The Netherlands, Leiden is the most beautiful city. 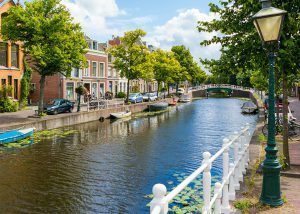 And of all Leiden’s streets and canals, Rapenburg is the most beautiful.” This rather bold statement is ascribed to Johan Polyander van Kerckhoven (1568-1646), professor of theology and chancellor of Leiden University. It was cited by contemporary and fellow professor (of French) Jean-Nicolas de Parival (1605-1669) in his book Les délices de la Hollande. Whether Rapenburg in Leiden truly is the most beautiful canal in the world is in the eyes of the beholder, I suppose. But with its stately town houses, historic importance and magnificent layout, it is most definitely up there. Rapenburg was dug as a part of the fortifications protecting the city of Leiden at its south side. It is first mentioned in city sources in 1360. It starts at the ‘Old Rhine’ where a short stretch (known as Kort or Short Rapenburg) of the canal was covered over in 1911 to improve traffic flow. From there it runs in a crescent shape back to the ‘New Rhine’. The last stretch of the canal is known as Steenschuur rather than Rapenburg. The total length of Kort Rapenburg-Rapenburg-Steenschuur is just a little over a kilometer (1100 yards) long, of which the Rapenburg proper stretch is 630 meters (690 yards). One hundred and four buildings on Rapenburg and an additional sixteen on Steenschuur are national heritage buildings (rijksmonumenten). So in a walk of less than two miles (take one side of the canal one way, and head back on the other side) you can see 120 carefully preserved, historically significant buildings dating mostly to the period between the mid-17th and late-18th centuries. The Sieboldhuis (#19) is a former stately home which now functions as a museum of Japanese culture. Many of its stunning artifacts were acquired by the erstwhile owner of the house, Philipp Franz von Siebold (1796-1866) during his stay at Deshima near Nagasaki as a member of the Dutch trade mission there. Bibliotheca Thysiana (#25) is a library which houses the book collection of scholar Johannes Thysius (1621-1653). The library was designed especially to house the 2500-tome collection. It was included by the National Heritage Department in its list of one hundred most significant heritage buildings in the country and is the only 17th-century library still being used for its original purpose. The National Museum of Antiquities (#28) is situated in an old beguinage and was instituted as the national archeological museum by King Willem I in 1818. Many of the other heritage buildings are residences, including a number of fraternity and sorority houses associated with Leiden University. The connection between the city, the university and Rapenburg in particular is strong. The Academy Building (#73) was built in 1516 as part of a Dominican convent. After the Reformation it was confiscated and in 1581 donated to the university, which had been chartered six years before, in 1575. Leiden University is the oldest university in The Netherlands and one of the most prestigious ones. Among its alumni it boasts sixteen Nobel Prize winners, more than any other Dutch university. It was founded by William of Orange and it is generally presumed to have been a gift for the steadfast role Leiden played in the struggle against the Spanish during the Dutch War of Independence (or Eighty Years’ War). The university has always maintained strong ties with the House of Orange. The three most recent monarchs, Queens Juliana and Beatrix and King Willem-Alexander are all Leiden alumni, and the latter two lived on Rapenburg (#45 and #116 respectively) while they studied there. Among the many renowned alumni of the university is also American president John Quincy Adams (1767-1848). The Academy Building is the oldest and principal building of the university. One of the many proud dates in its history is November 26th 1940, early during the German occupation of The Netherlands, when law professor Rudolph Cleveringa (1894-1980) held a lecture in its main auditorium protesting the dismissal of his Jewish mentor and colleague, professor Eduard Maurits Meijers, and other Jewish professors. Cleveringa was arrested by the Nazi occupation forces for his rebellious address. The students who poured out onto Rapenburg from the packed auditorium after the lecture started a spontaneous strike in solidarity with Cleveringa and their Jewish professors and fellow students. The student strike closed the doors of the university until the end of the war. After the war ‘Cleveringa Lectures’ were initiated in memory of the professor’s bravery and of the way in which he gave true meaning to the university motto Praesidium Libertatis (Bulwark of Freedom). In these lectures, which are held all over the world, Leiden scholars share their knowledge with a global audience. As one walks from Rapenburg to Steenschuur, the unexpected gap in the row of buildings lining the canal is striking. Instead of buildings, one encounters the Van der Werf Park, a pleasant oasis of green in the densely built-up downtown Leiden. It was not always there. On January 12th 1807, a ship on its way from Haarlem to Delft lay moored at the Steenslag canalside – its cargo: 37,000 pounds of gunpowder. A spark, maybe from a cooking stove, ignited the gunpowder and caused a devastating explosion which was heard in The Hague, ten miles away. It flattened an entire neighborhood, indeed, right where currently Van der Werf Park is. One hundred and fifty-one people were killed, two thousand were injured and 220 houses were destroyed. A commemorative inscription on the edge of the canal indicates where the ship lay when the disaster took place. It took many years before all the rubble was removed and the ruins of the explosion cleared. But now, 210 years after the disaster, one can sit in the park and contemplate the rich history of Rapenburg. And enjoy the many special sites of the “most beautiful canal in the world”.